Do You Know Where Your Water Comes From and More? I live in East Point, Georgia. At my home, my tap water does not magically appear in a glass. My filtered water comes from somewhere, piped from river to faucet. 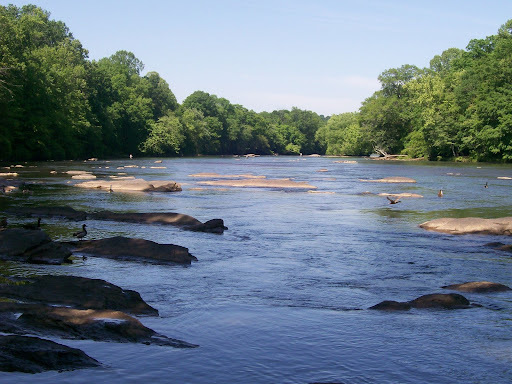 My water comes from the Chattahoochee River–actually starts further north–that feeds Sweetwater Creek in Austell, Georgia, which is about 20 minutes from Atlanta. The water moves by pump to the Ben Hill Reservoir, about five miles from creek. This liquid essential to life on earth is processed at the East Point Water Treatment. I press a button on my fridge and water from the Chattahoochee, so far away, flows into my cup for tea. I am grateful because people around the world do not have such easy access to clean water around the world. I do my best to get my drinking water from the tap and not bottled water so I’m not adding plastic to the swelling landfills. You are probably drinking the same filtered water I do when you drink from the bottle. And there are chemicals in the plastic bottles that potentially threaten our health. We are also facing drought around the world. Here in Georgia we have to live with cyclical drought. I was told a few years go that I might not get water piped into my home because of drought. Trust me: that was unnerving. Georgia seems unwilling to share their water from Lake Lanier with Florida and Alabama because of fears around drought. These issues over water rights will probably get worse as climate change continues to escalate across the globe. To learn more got to EPA’s Drinking Water for kids and rent the the documentary Tapped. So I ask you: where does your water come from? Learn the source of your water, and for that matter your food. Consider drinking tap rather than bottled. And heed the warnings about global warning, which is impacting access to good clean water in as far away as Africa and as close as Georgia. I have been hiking on easy to moderate trails for about twenty years now. I started hiking in the Atlanta area by myself until my mother and brother made me promise to stop going out alone. I’ve hiked in Malibu, California, Washington, D.C., and Upstate New York. If you plan to stick to easy trails, well any trails, find a friend to go along with you. There are also organizations like the Sierra Club that do hiking outings. They even organize nature trips for youth. I get email updates from Keeping it Wild, a multicultural environmental non-profit for outings and an alternative to the larger mainstream organizations. You get to hike in a group and meet new people! I’ve gone on several hikes including Sweetwater Creek and Cascade Park in the Atlanta Metro area. Kinda creepy with no body in the clothes. Water resistant jacket from REI. Toilet paper – sometimes you find empty rolls in park bathrooms! For cold days consider: a cap, gloves, and wool socks. I’m looking to purchasing some of this items in material that wicks perspiration. I like REI when shopping for some items. The staff is kind to someone like me who often walks in with newbie duh questions! Please do stretch before and after hiking to avoid and diminish injuries to the muscles.